Just above the CPU is the L2 memory cache expansion slot. I could understand how you might think it was for a Slot 1 CPU, but it isn't. more upmarket boards used to have a 512KB L2 module built into the motherboard. Some high end boards like the Tekram MVP3G had what they called "3D-Now! TURBO" which was an 8MB L2 cache on the board itself that really put some kick into K6-2s and K6-3s. the external L2 cards were a common feature, but the cards themselves are quite rare. OK then. I dont have a CPU expansion slot. How fast do the socket 7's go up to? socket 7s toped out at 800mhz. Thats a K6-2 550Mhz overclocked to 8X100. you can still buy K6-2 500s and 550s and the odd rare 600. But it depends on the board. There are socket 7, socket 7 enhanced and super socket 7. Standard socket 7 tops out at 233mhz or so, while top end super socket 7s can hit 800Mhz. The best Socket 7 CPU was a K6-3+ 550 Mhz. 550 was also the highest speed K6-2. 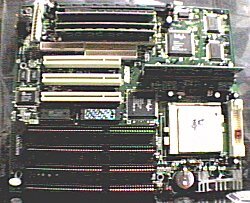 But since the K6-3+ was made with the .18 micron process, and featured 256K on die L2 memory cache, it was significantly better than the same speed K6-2, which was made with the .25 micron process, and had no on die L2 cache.Never released for desktop use, they, and their K6-2+ counterparts (128K L2), were a final overhaul of an obsolete CPU for use in laptops. But many found their way into desktops anyway. The K6-3+ 550 is one of the rarest CPUs ever made, and I recently saw one sell for $200.00 on Ebay. As I mentioned before, having a low enough core voltage, and at least a couple of clock multiplier settings may allow you to run a K6-2/3 between 400 and 500 Mhz on your motherboard. But finding out precisely what it is will help determine for sure how fast it can go. This mo/bo is about 7 years old. Would it be a standard socket 7? I thought K6-2's were AMD? If your motherboard has a VX chipset, and a cache slot, it dates from probably 1996. It has a 66 MHz bus, and probably a 2.5 multiplier setting max. Name and model number are what I want to know. Yes, the K6-2 is an AMD product. In 1996 you could buy a motherboard, and choose a CPU made by Intel, Cyrix, AMD, or Winchip, all Socket 7. AMDs run great on Intel chipsets. Yes, it is a standard Socket 7. Super 7s were released in early 1998 or so, and featured 100 Mhz bus and AGP graphics. To understand better, see Oldie tuning . Last edited by Repo Man; 20th March, 2005 at 04:09 AM. And have a look at the board to see what bus speed, voltage, and bus multiplier settings are listed on it. If you have a setting for a clock multiplier of 2x, and at least as low as 2.5 volts core, you're in business. Last edited by Repo Man; 20th March, 2005 at 04:57 AM. Im not really looking at overclocking, im just looking for a socket 7 CPU of at least 233mhz. Base clock ranges from 50mhz to 66mhz. Multiplyer ranges from 1.5-3.0. In .5 increments. Last edited by Rondog; 20th March, 2005 at 04:58 AM. ron where in Aus are you? ive got plenty of socket 7 rubbish around and i would be happy to dump it on you. If you dont take it Vinnies will. You can't beat an offer like that! I know this isn't about getting great performance. But a 400 MHz K6-3 would allow you to use a great variety of operating systems without throwing it out the window in frustration. To a lesser extent a 400 Mhz K6-2 would also. If you are going to use it at all, it might as well be the best it can be (provided the parts can be obtained for little or nothing). No thats not it. Very similar, but not identical. Im im moulamein, nsw victorian border. Really? what have you got? How much do you want for postage? K6-3's are pretty price-y though. I think I may just go K6-2 or whatever dsio is willing to sell to me. That's too bad if they are still commanding a good price in AU. Here in the US they are going for around $15.00 for a K6-3 400. And a K6-2 of that speed is around $10.00 or even less. But you now know you have options. Also, I wanted to mention that though that board only has an ATA33 controller, ATA66 and 100 drives will work, and will give you much faster performance. Most of those old WD 2 to 10 gig ATA33 drives will test at around 4 to 6 megabytes per second. I tried an ATA66 drive on one, and it tested at almost 20 megabytes per second. I then hooked it up to a Promise RAID ATA66 controller, and it tested at exactly the same speed. The drive was the choke point, not the controller. I think this is probably true of many ATA66 drives, and probably a few ATA 100s. I had a WD ATA100 30 gigabyte drive that barely hit 30 megabytes per second on an ATA100 motherboard. It doesnt have to be a king-pin system. I just want something to run linux. This brings me to my alteria motive. This system will be my next mod project. Paint the case black: and spraypaint a linux stencil in red on the side. Put a fan duct out the side of the case, and cover it with a metal grill and put a red led fan instead of the stanard CPU fan. Has anyone got a "Powered By Linux" Stencil or am I going to use my "Linux Inside" one? Hooray My First Jumper Overclock!!! Third attempt: 60x3=180mhz very very stable. Last edited by Rondog; 20th March, 2005 at 05:37 AM. its probably not worth the postage. Just a socket 7 mobo thats probably a lot better than yours but not quite a super 7. And a P200. And some ram if needed. The motherboard is an ATC-1020. Now what?